Nourisil™ MD Silicone Scar Gel is an ultra-light, transparent, self-drying silicone gel, which has been developed for the prevention and treatment of new and old keloid and hypertrophic scars that result from medical and cosmetic surgical procedures, wounds, trauma, or burns. Nourisil™ MD Silicone Scar Gel creates a silicone barrier that enables the skin to release moisture at normal levels. This reduces the amount of collagen produced in the scar area therefore reducing the severity of a scar’s features. Containing a unique blend of 5 silicones which are known as the gold standard for scar treatment. Studies have shown that, when added to silicone, Vitamin E improves the effectiveness of the treatment of scars. Fragrance and preservative free and is suitable for use on all skin types, including sensitive skin and on children. Nourisil™ MD Silicone Scar Gel has an elegant silky feel and dries in 60 seconds for an average size scar. Ready to use 30g airless dispenser. The self-sealing valve stops air from coming in and prevents the product drying out. Nourisil™ MD Silicone Scar Gel is a non-invasive Class I medical device based on the European Directive 93/42/EEC, Annex IX Classification Criteria. Nourisil™ MD Silicone Scar Gel contains safe ingredients and is suitable for use on all skin types and on children. Nourisil™ MD Silicone Scar Gel is easily applied to scars on all areas of the skin, including the face and joints and can only be applied after the wound has healed (or stitches are removed) and the skin surface is intact. Remove cap from dispenser. Press the pump to make the gel appear. 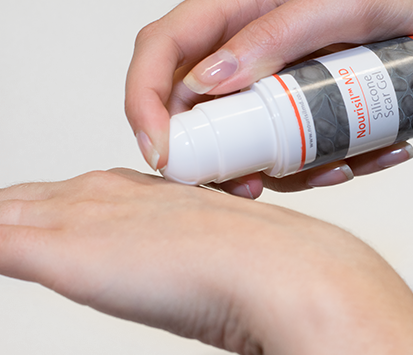 Gently massage a small amount of Nourisil™ MD on the scar and allow to dry. Once dry, Nourisil™ MD Silicone Scar Gel may be covered with sun block or cosmetics. Apply Nourisil™ MD Silicone Scar Gel twice daily; once in the morning and once at night. Use for 60-90 days (or longer for older scars). Who Should Use Nourisil™ MD Silicone Scar Gel? Nourisil™ MD Silicone Scar Gel has been designed for the treatment and prevention of hypertrophic and keloid scars which result from medical and cosmetic surgery, wounds, trauma or burns. Nourisil™ MD Silicone Scar Gel contains safe ingredients and is suitable for the use on skin types of all ethnic background and on children.